Hyphae are usually the only fungal elements found in tissue of mucormycosis, and other fungal elements are quite rarely encountered. We found chlamydospores in bronchial lumina in autopsied tissue of pulmonary mucormycosis of a diabetic patient. Chlamydospores are thick-walled, asexually produced spores arising from the modification of a hyphal segment. 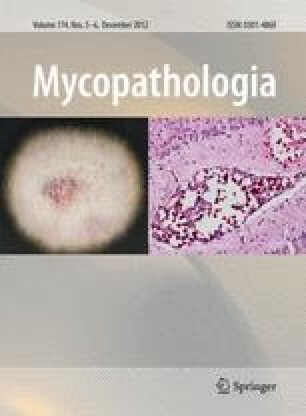 This is the first histologic demonstration of chlamydospores in mucormycosis in which the causative fungus is culturally identified to species level. Rhizopus microsporus var. rhizopodiformis was isolated from the present autopsied pulmonary tissue. A literature review of human infection by this fungus found 27 cases with histopathologic evidence. The authors gratefully acknowledge the help of Mr. Yoshitaka Horiuchi, Life Science Research Institute, Kinki University, Osaka-Sayama, Osaka, Japan, in performing scanning electron microscopy of the cultured fungus and Prof. Michiaki Masuda, Department of Microbiology, Dokkyo Medical University School of Medicine for his genetic analysis.